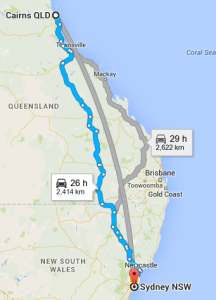 Driving from Cairns to Sydney can take you about 45 to 50 hours. This is because the distance between these two cities is more than 4,000 kilometers. Roadways Furniture Removals is Australia’s most trusted interstate moving company. If you have a household to move, Roadways Furniture Removals is your most cost-effective choice on Cairns to Sydney Removalists service. We are reliable, with years of experience and an established reputation in the Australian removals industry. Hire us if you need customized, efficient and quality removals services from Cairns to Sydney. With our interstate backloading service, you will be able to save money. Roadways charges you only for the space your goods occupy in a truck. The procedure is almost similar to the method applied by airlines where the same aircraft carries goods for different clients. You will be sharing cargo space in the truck/van with other clients bound for Sydney. This means reduced hiring and transportation costs as compared to paying for the whole truck or container. Our interstate vehicle transport specialists can deliver your car and/or bike to your required destination in Sydney, or you can come and collect it from one of the depots in Perth. We take the necessary precautions to ensure your vehicle is transported safely and with zero damage. Let us help you move by selecting Roadways as your preferred Cairns to Sydney Removalists. Roadways excels in interstate removals – from planning to pre-packing to moving and settling you in, we can help you all the way. Ask for a quick estimate now!